More broadly, with the emergence of patent-killing shops like RPX and Unified Patents (“We challenge Bad Patents and Never Pay”), an urgent question facing all patent owners is whether RPX or Unified’s clients or their ultimate paymasters (Google, et. al.) will be barred under the real party in interest doctrine of 35 U.S.C. § 315(b) when RPX or Unified files an IPR on their behalf. Unified claims that it protects technology areas by attacking patent trolls. Before proceeding further it is worth examining in some more detail the term “patent troll” which is rightly called “irrelevant prejudice” and “unhelpful.” It is clearly a pejorative term, notwithstanding disingenuous claims otherwise. A fair understanding of the historical role of patent assertion or nonpracticing entities will show that they can provide significant benefits. Indeed, as noted above, patent pools are very good for the technology ecosystem and significantly reduce the transaction costs of doing business in an IP rich field. That said, no one seriously disputes that filing non-meritorious litigation is bad and deserving of pejoratives like “troll.” Perhaps it makes sense to use concepts from statutes relating to vexatious litigation to define a “true” patent troll as an entity that: engages in repeated re-litigation of decided issues; files unmeritorious petitions/cases; engages in unnecessary motions and legal procedures; and tries to burden targets with defense costs to achieve specific a business goals. Under this working definition of a “patent troll” a PTAB petitioner can most definitely be a troll. They could be filing IPRs solely to support short sale positions against the patent owner; engaged in serial refiling of petitions with the same or similar prior art; or using the fact that PTAB decisions on validity trump existing decisions of district courts or the Federal Circuit. Thus, filing multiple IPRs for the sole purpose of causing economic damage through litigation costs to a patent pool that has yet to file any litigation seems like the classic example of an IPR troll. With that out of the way, to understand what Unified’s game is here we must look at some more background. MPEG-H Part 2, is a video compression standard codified under the International Telecommunications Union (ITU) in 2017. The creators of the standard claim that HEVC is able to reduce in file sizes by 50% while using far less processing power than the prior video coding standard, H.264. HEVC compression is used in products that encode and decode video for Internet, television and mobile transmission, reception and use such as mobile handsets, set-top boxes, 4K Blu-ray players, game consoles and media streaming devices. Augmented reality and virtual reality devices are a major use case for HEVC as the relevant video cannot be properly encoded and decoded in real time on consumer platforms with older codecs. Given the increasing visual turn of the internet and games and the gamification of our culture of work, it is no wonder that video coding is an increasing significant part of media and advertising companies and that primary players in that space, like Apple and Google, would want to keep technology costs low. Those wishing to take a license to HEVC will need to deal with individual licensors such as Nokia and three patent pools representing different companies. While dealing with 3 patent pools is not ideal from an efficiency perspective, it is certainly much better than forcing potential licensees to deal with well over 15 patent holders. The three pools are: MPEG LA (which includes Apple, Canon, JVC Kenwood Corp, and Samsung Electronics), HEVC Advance (including Dolby Labs, GE, Mitsubishi Electric Corp., Samsung Electronics, and Warner Bros. Entertainment) and Velos Media (including Blackberry, Ericsson, Panasonic, Qualcomm, Sharp and Sony). While it is certainly no surprise given Unified’s anchor customer’s (Google) extensive funding of SEP restrictionists, that Unified is focusing on SEP patent killing, the choice of HEVC – given the lack of any publicly reported litigation in this space – might seem curious at first. Moreover, Unified seems to be trying to make public as much of the standard development proceedings behind HEVC (which proceedings are typically not easy to access by the general public) as possible. Finally, Unified is actively promoting through social media their IPRs of Velos. They claimed to have IPR’ed almost 30% of Velos’ US patents. This is incorrect. Unified’s claim is true as it relates to recorded assignment documents filed by Velos Media. Unified’s lazy claims are quickly undermined, however, by simply clicking to review the recorded assignments to Velos Media which show (when the 27 listed assignments are added up) 169 issued patents at the time of the assignment as well as a large number of applications. So, simple math indicates that Unified filed IPRs on about 5% of Velos’ patents. But it is even less than that. A quick perusal of Velos’ website shows that it claims the right to license ALL of their members’ HEVC SEPs. Since these companies had outsized roles in creating the HEVC standard and, frankly, those companies’ histories of large-scale patent, one should assume that they each have large HEVC SEP portfolios. Indeed, according to Velos’s website they have the right to license any HEVC essential patents from their contributors Qualcomm, Panasonic, Sony, Ericsson, Sharp and Blackberry in the pool. These companies’ HEVC related assets include 763 US patents and 463 US patent applications, and over 5085 patent and 5720 applications world-wide. With those numbers Unified’s IPRs of Velos amount to a meager 1% of Velos’ HEVC SEPs, not what it claims in its PR. Given the persistent rumors that Unified Patents (and RPX) trawl the USPTO assignment records looking for newly assignment patents to IPR, it is not surprising that sophisticated players are avoiding recording assignments as long as they can. Unified is also going after GE’s HEVC patents claiming that it has filed IPRs against 44% of GE’s “known assets” to date. As of early March 2019, Unified filed 3 IPRs against GE Video Compression (IPR2019-00617; -00659; 00726). It is interesting to note that the 3 GE patents targeted by Unified originally come from Fraunhofer, including one patent invented by Benjamin Bross, Chief Editor of the HEVC standard. In any event, by last count GE Video Compression (the GE entity whose patents are included in HEVC Advance) has 58 issued patents assigned to it. Unless there is a secret IPR process of which I am unaware, Unified has only filed against just over 5% of GE Video Compression’s recorded issued patents. To figure out what is going on here – other than poor mathematics – requires peering into the business interests of Unified’s benefactors and how they stand to benefit from damaging the HEVC pools. Unlike the MPEG LA terms, HEVC Advance tried to introduce license fees on content encoded with HEVC, through a revenue sharing fee but in March 2018 decided to eliminate this requirement. As far as current royalty rates, despite initially higher rates, they now reach a maximum of $0.65 for a mobile device, $1.30 for connected home and other devices and $1.95 for 4K UHD+ TVs. Moreover, most licensees are likely currently paying much less. Additionally, HEVC Advance made publicly available a rather detailed, 48 page White Paper outlining how their rates were FRAND compliant. As of today, MPEG LA lists 266 licensees and HEVC Advance claims 91. Velos has not listed its rates yet, but they are rumored to be somewhere between $0.75 – $1.00. Additionally, an independent study of all royalties for HEVC puts the likely rate at $2.25 a device when all pools and are included. Unified’s aggressive push to kill HEVC patents is most likely tied to the Alliance for Open Media’s attempt to develop a new open source (READ: free) video compression standard. Given that the Alliance’s founding members include Google, Amazon, Cisco, Facebook, Microsoft, and Intel – some of the world’s most notorious anti-patent lobbyists it is no surprise that their favored creature, Unified Patent is doing their dirty work by killing the competition through IPRs. Moreover, it makes sense that Unified is going after HEVC Advance’s GE and Velos because Apple is a member of MPEG LA and because MPEG LA’s rates are low enough that it is probably not worth the effort. Indeed, Unified is aggressively promoting its study purporting to argue for a lower royalty rate for HEVC – which in large measure tries to argue that HEVC royalties should be more in line with MPEG LA’s rates than HEVC Advance published rates or Velos’ rumored rates. Unfortunately, the full study (unlike HEVC Advance’s) is for members only, but it was vigorously attacked in the media as fatally flawed. The failure to release the full report is ironic because Unified is constantly banging the drum about how NDAs are bad in FRAND and repeatedly takes Velos to task for following a well-established approach under FRAND and requiring an NDA. That is because the actions of PTAB trolls like Unified do not impact the real parties behind Unified’s trolling because – at the PTAB – the real party in interest doctrine is a mess. While the scope of IPR petitioner estoppel remains a confused and confusing area of law, there appears to be broad agreement that allowing multiple IPRs on the same patents is unfair even by those who dispute whether they are in fact occurring. The Federal Circuit seems to be trying to impose some level of sanity. For example, it found in September 2018 in Worlds Inc. v. Bungie, Inc., that the petitioner bears the burden of persuasion on the issue of whether a petition properly named all real parties in interest, the question of who is in fact the real party in interest such that they will be bound by any ruling in an IPR continues to cause problems. The petitioner acts as a proxy to re-litigate the same issues. Determining whether a non-party is a “real party in interest” demands a flexible approach that takes into account both equitable and practical considerations, with an eye toward determining whether the non-party is a clear beneficiary that has a preexisting, established relationship with the petitioner. And yet the Patent Trial and Appeal Board (PTAB) has not seemed to have received the message, instituting IPR2018-01047, filed by Google. In that IPR Google – despite a hearing where this issue was argued – was not required by the PTAB to identify, its parent and 100% owner, Alphabet Inc., as a real party-in-interest under 35 U.S.C. § 312(a)(2). It will be interesting to see (if the suit is not dismissed) how the courts connect the interests of Google in Alphabet as it relates to key payouts of former Google employees and whether these connections are applicable to the PTAB. It thus, not surprising that the PTAB consistently refuses to find the members of Unified Patents as real parties in interest. For example, in, Unified Patents, Inc. v. Realtime Adaptive Streaming, the PTAB instituted the IPR despite finding that Unified’s business model was the same as RPX. That is, a for-profit company that files IPRs to serve its clients, with whom its interests are 100% aligned. Despite this, the PTAB, in tension with the Applications decision, asserted that the inquiry does not end there, rather because “a litigant is not bound by a judgment to which she was not a party” except in special circumstances. While this may in fact be a general principal, it would seem that Congress’ intent when deciding that RPIs are to be named in an IPR petition was to severely limit that rule. The PTAB then tried to distinguish Applications by arguing that that the Applied decision was rooted in a unique situation, specifically the relationship between RPX and Salesforce (the party who stood to benefit from the petition in Applied). For example, unlike with RPX, none of Unified’s members share officers or board members with Unified. Nor were there any significant payments made shortly before the IPR was filed, as appears to have been the case in Applied. Most importantly, according to the PTAB, unlike in Applied, no members of Unified are time-barred but want to file an IPR. What the PTAB seems to be saying is so long as an IPR benefits lots of members or shareholders in a patent-killing company equally, then no members need to be identified as a RPI, but if a single member benefits, then they must be identified. Or, in other words, if one person is responsible then they are liable, but if everyone’s responsible, no one is one is liable. That’s a pretty neat legal blessing for the diffusion of responsibility. It will be interesting to see what the Federal Circuit makes of it. Hopefully with the appointment of a PTAB chief and deputy chief, the PTAB will be encouraged to take a more compliant approach to Federal Circuit precedent, and common sense. would require filing an 8-k were either the petitioner or the entity a public corporation, then it should be a rebuttable presumption that the entity is a real party in interest. 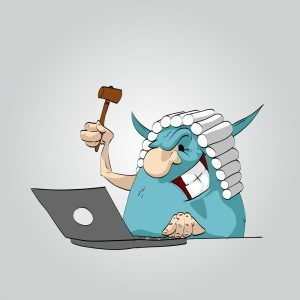 In any event, it is not a good thing that proxies can troll the PTAB on behalf of large companies who stand to benefit from the proxies’ patent killing.